N.C.C. - National Cadet Corpses : One platoon of infantry of N.C.C.unit for Boys has been allotted to this College. The Infantry Wing is located in the Salipur College compound, named A/3/1. P.L. N.C.C.under Prof. Dr. M. M. Das. This platoon is attached to I (O) B.N.C.C.,Cuttack one N.C.C. unit has been opened for girls students from 26th March 2004 with intake capacity of 50 students cadets under the officer incharge Ex-A NO Mrs Prabasini Devi, Lecturer in Education thereby fulfilling Long standing demand for students. Enrolment is open to all students who satisfy standard or physical fitness. Enrolment form can be had from N.C.C. Office or from the N.C.C. Officer Capt. M. M. Das, Head of the Department in Philosophy. Training commences in August. The Enrolment form duly filled In must reach the N.C.C. Officer or the N.C.C. Office prior to the commencement of the training. N.C.C. students are not allowed to be enrolled in N.S.S. and Y.R.C. Charges of indiscipline made against a cadet will be seriously dealt with and will be disposed of as per procedure and punishment in the N.C.C. Act. 1948. The aims of N.C.C. are development of leadership character commandership, spirit of sportsmanship and the ideal of service and to create a force of disciplined and trained manpower, which in a national emergency would be of assistance to the country and to provide training of student with a view to developing in them officer like qualities, thus also enabling them to obtain commission in the Armed Forces. 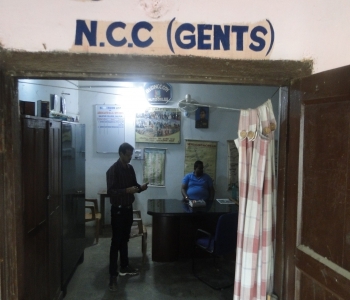 Students having N.C.C. qualification are always given preference in competitive examination like NDA, IMA etc.